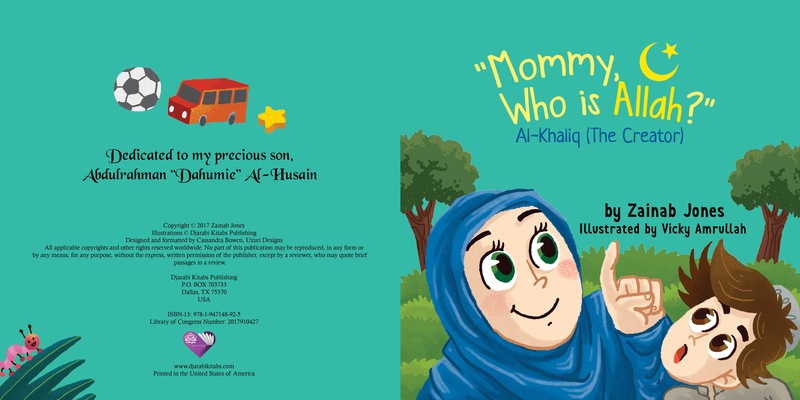 Book Review – “Mommy Who is Allah?” by Zainab Jones. | Between Sisters, SVP! “Mommy who is Allah?” by Zainab jones is a wonderful book for Muslim kids explaining the attribute “Al Khaliq” – the creator. It’s a story of a Little boy called Abdul Rahman who asks his mother about who is Allah and her mother replies him explaining that He is the Creator of every single thing in the universe. It is perfect for kids as the language is colorful and lively. I simply loved how the mother explains to her son about various things. The book will be loved by kids, as mothers can use actions used in the book. That is how kids need to be taught, using variations in voice, change in tone, using colorful words, hand motions and animated style. The illustrations are beautiful, colorful and sure to attract and interest young readers. I also like how the mother is wearing a hijab, a full muslim dress. This entry was posted in Children's Literature and tagged 99 names of Allah, al-Fattah, Al-Khaliq, Mommy Who Is Allah, Susan Jones, Susan Zainab Jones, The Creator. Bookmark the permalink. 1 Response to Book Review – “Mommy Who is Allah?” by Zainab Jones.